Overall, turnout was down in the Florida Republican primary from 2008. In 2008, 1.95 million votes were cast in the Republican primary, compared to 1.67 million cast in 2012 (reported by the Florida State Board of Elections as of the morning of Feb. 1). A decline of 280,000 votes. What does it mean? Mitt Romney needs only to look in the mirror -- or better yet, the graph below -- to see who is to blame for the decline in turnout. The fact is, they're just not that into you, Mitt. In the graph I've plotted by county the percent vote for Gingrich against the percent change in turnout from 2008 to 2012. The graph tells a clear story. 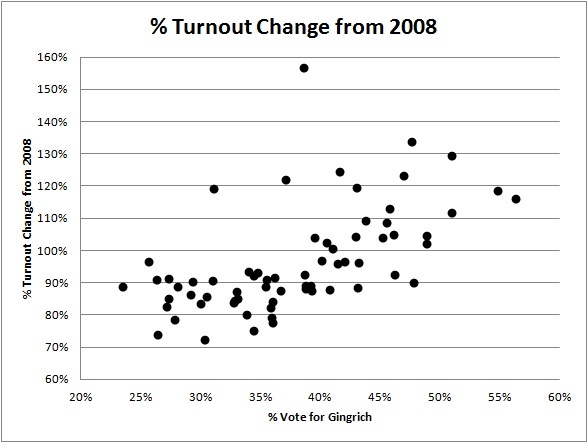 In counties where Gingrich did better, Republican turnout was up over 2008. In counties where Romney dominated, turnout was lower. Romney draws his strength from urban counties and Gingrich draws his from rural counties. The suburbs appear to the the battleground region with Romney winning suburbia in two of the three truly contested races so far. This turnout insight provides a chance to evaluate the campaign strategies of the candidates in the primary and general elections. As the Republican primary progresses, we may expect to see similar patterns emerge in contested states. Who wins or loses a state may be attributed at least in part to the demographic composition of the state. Fortunately for Romney, there are a string of favorable states lined up for him in the next month -- states with significant Mormon communities or more moderate voters. Gingrich's challenge is to survive the inevitable punditry calls for him to drop out as Romney racks up wins. If Gingrich can make it to the March 6th super-Tuesday primary, he will likely do well in some of these states and he can change the media narrative. The fly in Gingrich's ointment will be Ron Paul, who is targeting the smaller states that hold caucuses. What will happen in the general election if Romney is the nominee is anyone's guess. I suspect that Republican conservatives will line up behind Romney, but they will not do so enthusiastically. And while Romney does well among moderate, urban and suburban voters, the lack of enthusiasm exhibited by these voters should caution Romney that he may not continue to do as well among these voters when his opponent is Barack Obama. This would not matter in deep red states, but could matter in some battlegrounds like Florida, North Carolina, and Virginia -- states where the Obama campaign appears to be targeting and where he can rely on enthusiastic African-American voters.